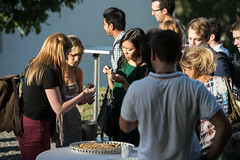 Barcelona GSE Director Teresa Garcia-Milà officially welcomed new masters students on September 19 at Bellaterra Campus. 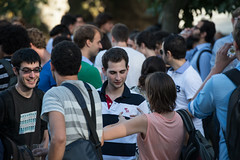 Members of the Barcelona GSE faculty, staff, and alumni community also participated in welcoming the Class of 2014, the seventh cohort of students to enter the School's intensive one-year master programs. 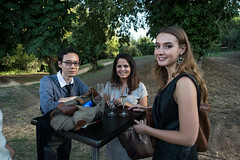 In her remarks to students, Prof. Garcia-Milà said that she hoped they would leave at the end of the master year with mixed feelings. "I hope you feel excitement and satisfaction that the master has provided a springboard for your career, and at the same time sadness to leave friends, professors and colleagues," she said. Barcelona GSE Director Teresa Garcia-Milà welcomes the seventh cohort of masters students. This year's students also had the chance to hear advice from recent graduate Lavinia Piemontese '13. "Try to enjoy the intensity and the diversity that characterize this school," she told students. "You will have the chance to work in teams of students with different backgrounds, ideas and approaches. You will cooperate to solve complex problems and, at the same time, you will have the chance to make new friends." Lavinia Piemontese '13 offered students the alumni perspective. 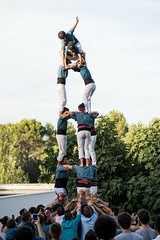 As they did last year, new students enjoyed a demonstration of human castle building and even got to participate by helping to create the solid foundation needed to support these impressive structures.